Stuck for what to get the believer who has everything this Christmas? Fear not, Red has the answer. 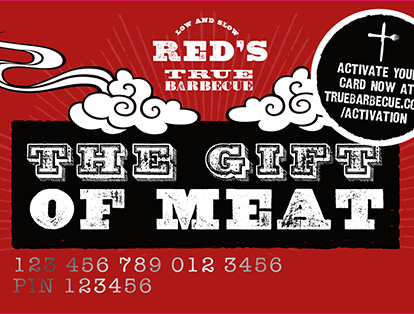 Reward them with the Gift of Meat – the Red’s True Barbecue gift card which is pre-loaded with your generosity and available in denominations ranging from £10 up to £200. Click below to buy an email gift card. You can add your own personal message and send it either immediately to the lucky believer, or to yourself so you can print it at a later date. Physical gift cards can also be bought in all churches of worship – these will be available on the online shop closer to Christmas. 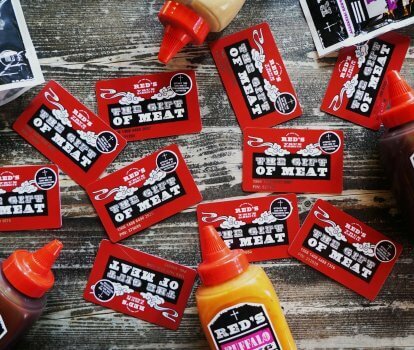 All gift cards are valid for 12 months from the date of purchase. Non-transferrable – the gift card can not be exchanged for its monetary value in cash.